1 Hour Paddleboard Rental at Lake Las Vegas. Times vary through the day, weather permitting. 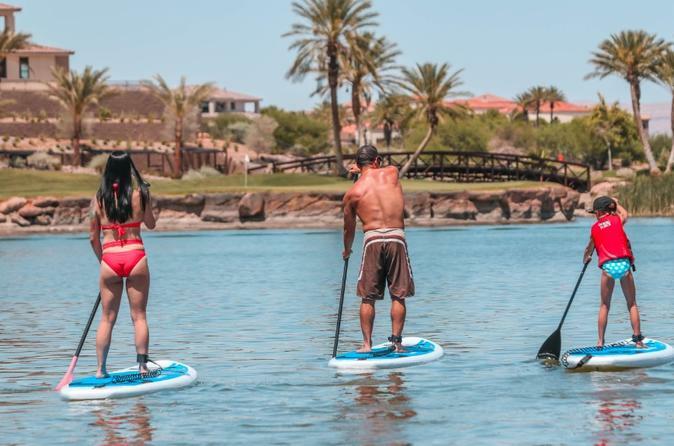 Come enjoy 1 hour of Paddleboarding at any of our locations at Lake Las Vegas. Cruise along the calm waters and experience why Paddleboarding is quickly becoming the most popular water sport around. The waters of Lake Las Vegas are unlike any other in the world due to it being a no wake lake. Lake Las Vegas in Henderson, Nevada, refers to a 320-acre artificial lake and the 3,592-acre developed area around the lake. The area is sometimes referred to as the Lake Las Vegas Resort. Discover an incomparable desert oasis elevating residential resort living in the Las Vegas valley. Just minutes from McCarran Airport and the Las Vegas Strip.